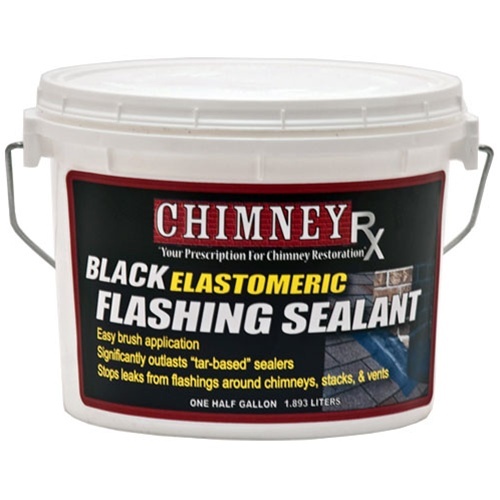 ChimneyRx Black Elastomeric Flashing Sealant is excellent for use in stopping problem leaks around the base of chimneys, stacks and vents. When used to repair chimney flashing leak at the base of a chimney, ChimneyRx Elastomeric Flashing Sealant provides a weatherproof “boot of protection” for the chimney. Available in half gallon containers. ChimneyRx Elastomeric Flashing Sealant is an elastomeric sealant specially formulated for permanent adhesion to asphalt shingles, aluminum flashing, brick, and other chimney and roofing materials. 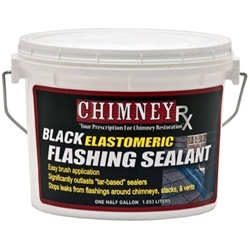 ChimneyRx Elastomeric Flashing Sealant is excellent for use in stopping problem leaks around the base of chimneys, stacks, and vents. It is also great for sealing around skylights. Repairing flashings that have been tarred, re-tarred or cracked has never been so easy. Note: On hot days ChimneyRx Elastomeric Flashing Sealant will dry quickly. Work in 2-3 ft. sections. Use of duct tape will produce clean edges and enhance the appearance of the repair. Coverage: 1/2 gallon covers approximately 14 linear feet.